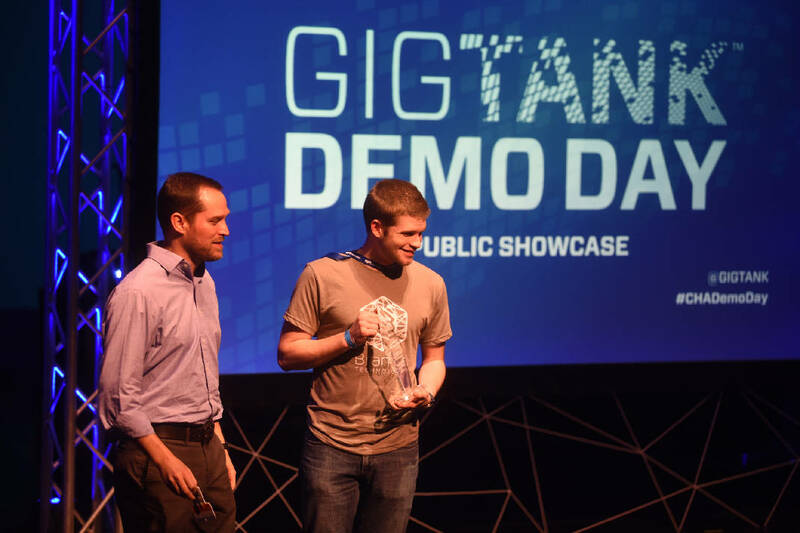 R. Platt Boyd, left, and Chris Weller, with Branch Technology, stand on the stage after receiving the Investor's Choice award at the Gigtank Demo Day Tuesday, July 28, 2015 at GPS. An accelerator for startups developing ultra high-bandwidth business applications. The Company Lab (Co.Lab), in Chattanooga, now offers it in the spring, summer and fall. Innovators across the world can apply for consideration. It's open to general gigabit-related businesses but focuses on 3D printing, software-defined networking and healthcare. It culminates with Chattanooga Demo Day, during which top startups pitch their business concepts to investors. › Feb. 22-May 31: GigTank 365 prototype will run concurrently with spring Co.Lab accelerator. Qualified candidates will be admitted on a rolling basis. Spots available for about eight startups across both programs. › May 16-Aug. 15: Summer cycle of GigTank 365 and Co.Lab accelerator. Spots available for about 10 startups across both programs. GigTank, the startup accelerator that gave rise to Feetz and Branch Technology, is expanding to become a year-round program, The Company Lab announced Wednesday. "GigTank 365" will offer a summer cycle as it has in years past, in addition to spring and fall cycles. "It's Co.Lab's job to help support aspiring entrepreneurs all the time," said Mike Bradshaw, the nonprofit organization's executive director. And Co.Lab's research shows that there's demand for it from startups with high-bandwidth business applications, GigTank's sweet spot, he said. Plus, continuity will make GigTank more "efficient and effective," Bradshaw said. The program relies on many established businesses and professionals. "It's better to keep a perpetual engagement with these partners than it is to spin it up for the summer, and then bring it down," he said. GigTank 365 will focus on three tracks — health care, 3-D printing and SDN (software defined networking) — along with a general gigabit business track. One more change: municipal power distributor EPB will provide its new 10 gigabit-per-second Internet service to Co.Lab's new location in the Edney Innovation Center, where GigTank 365 will take place. A prototype of GigTank 365 launches this month, the spring cycle. There will be space for about eight startups. Co.Lab already has candidates lined up for several of the spots, but admission is still open, Bradshaw said. One company that's participating is Collider, a 3-D-printing startup founded by Graham Bredemeyer — who worked with Co.Lab on its GigTank 3-D program in the past. Another is ProviderLinc, on the health care track. Co.Lab picked the three industry tracks believing they are "particularly ripe for transformation." GigTank has highlighted 3-D printing in the past, so it's no surprise it remains a focus. "That really nascent sector requires feeding, supporting it, year round," Bradshaw said. Co.Lab added the health care track after requests for its inclusion arose. Dr. Keith Helton, CEO of One to One, a local physician network, approached Bradshaw last year and asked why Chattanooga didn't have a health care accelerator. "I said, 'because I'm not a doctor. I believe it needs to be led by the health care community,'" Bradshaw recalled. Then he lobbed the question back at Helton, who responded that he didn't know how to run an accelerator. One to One is now GigTank's partner for the health care track. "Pairing technology-minded startups with experienced physicians can be a launch point for exciting changes in medicine that will increase access to care and deliver a better health care experience," Helton said Wednesday. GigTank 365 will officially launch with its summer cycle in May. Applications are now being accepted. As usual, free housing will be available to participants, courtesy of the University of Tennessee at Chattanooga. The extended program is a boon, according to Charlie Brock, president and CEO of Launch Tennessee, the public-private partnership under which Co.Lab operates. "This structure will enable more entrepreneurs who are working on innovative, high-bandwidth applications an opportunity to benefit from mentorship, connections and access to the only 10 Gig network in the country," he said. GigTank began in 2012, asking innovators to answer the question, "If you had the world's fastest Internet, what would you do with it?" The challenge was relevant, given Chattanooga's unique standing as the first, and for some time, only, place in the western hemisphere with 1-gigabit-per-second service. Mitra Malek writes about innovation, with a particular interest in the environment and wellness. Contact her at mmalek@timesfreepress.com. Follow her on Twitter @MitraMalek. Updated Feb. 11 at 6:40 p.m. for minor corrections.